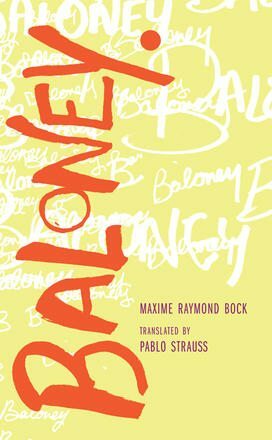 Maxime Raymond Bock, author of the short-story collection Atavisms (which won the 2012 Prix Adrienne-Choquette and appeared in an English translation by Pablo Strauss) and the novella Rosemont de profil, returns with the deceptive Baloney, a novella that initially reads as character study before delving into a deeply fulfilling exploration of what it means to write. When the book’s narrator, a self-proclaimed failed poet newly burdened with fatherhood, meets the prolific Robert “Baloney” Lacerte a year and a half before the poet’s death, he hopes Robert’s story will spur creativity back into his life. The book’s eight chapters alternate between Robert’s apprenticeship as a poet and the narrator’s present-day encounters with him at open-mic events. Poetry is the sustaining force in Robert’s life; he spends his adolescence working a succession of manual labour jobs while reading French-Canadian verse at night. We learn about his travels to South America and the death of a close friend. These events are sometimes regaled in romantic language, and a sentimental tone rings throughout the early chapters, in which poetry is ascribed life-saving qualities capable of inspiring the grandest notions of love that are otherwise absent in everyday life. It isn’t immediately clear whether it is the narrator or Robert who holds these views, and much of the book risks appearing nostalgic as a result. The revelation that Robert is a fraud ultimately resuscitates the narrator’s career – and saves Bock’s novella from sentimentality. Robert has spent a lifetime filling notebooks with poems. Boxes in his apartment are brimming with pages; he even uses bunk beds for additional storage. His isn’t a love of writing, but a compulsion – and Robert just isn’t very good. The poems are filled with poor spelling, clichés, and lifted lines; as Robert nears death, he is literally buried under pages of his own bad writing. Self-delusion may be every writer’s worst fear, but Robert has no qualms about lying to himself and others if it makes life tolerable. When the narrator finally sees through Robert’s fraud, he comes to a tremendously depressing realization. Can poetry save us? Probably not. But this is what makes good writing all the more vital.